This is the video recording from the live webinar Kids With Food Allergies Foundation (KFA) presented on 11/28/12. 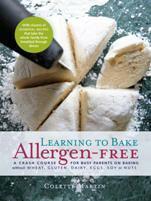 Our guest speaker was Colette Martin, author of Learning to Bake Allergen-Free. Topics include replacements for milk, eggs, soy, wheat and gluten and recommendations on how to get the best results for baking. We received almost 200 questions during the webinar. For those that were not answered, Colette responded on our blog: Baking Without Allergens - Your Questions Answered. Thank you! You can follow Colette Martin on her blog, Facebook page, or on Twitter. Her book is available on Amazon.com. We will be sharing additional Q&As asked during this class on our blog later this week!